If I could write a letter to myself and send it back in time four years, I would tell myself not to accept that Candy Crush invite and it is not a great idea to give Blaine that iPhone4 for Christmas. Like most parents, my husband and I want to give our children the world. As a bottom rung middle-class family, we strive for balance in what we can provide and what we know they should earn. In a way, that iPhone4 our son unwrapped on Christmas morning 2013 was exactly that. Our kind, hard-working boy was conquering the dreaded transition to middle school with stride. So …when we learned of the conveniently timed Verizon upgrade allowing us to give him that ever-so-coveted smart phone for a small monthly fee and nothing out of pocket, we didn’t hesitate. Because we could, we never stopped to ask if we should. Not once did we pause to question what impact this amount of technology could have on an eleven-year-old brain. Lucky for us, Blaine had no interest in Instagram or Facebook. This phone primarily meant he could now continue his Clash of Clan battles during long car rides. He was responsible and appreciative, and we thought we were parents of the year. Fast forward to 2017…Our son is now fifteen and his sister eleven. The iPhone has evolved 5 generations. Facebook and Instagram have too evolved beyond my usability and given way to the more popular Snapchat. As well as what I am sure amounts to countless other apps that a forty-one year old mom has no idea about. I have read countless headlines involving technology and the role it plays perpetuating young people into compromising situations. I see how this addiction threatens the present moment for both children and adults, myself included. And so when my daughter, now the same age as her brother when he began wielding that iPhone4, pleads for a smartphone, I feel a reticence that I only wish I had considered in 2013. Like her brother, she is responsible and deserving of reward. But unlike four years ago, there is a loud subconscious hesitation within me. Unlike her brother, she is not enthusiastic about Clash of Clans or Minecraft and is far more interested in Instagram and Snapchat. Who could blame her? All of her friends use it. It is fear of what I know I don’t know coupled with the horror stories about Finstagram that compel me to lend an apologetic “no” every time she asks. (For those of you who have not heard this term... here is how Finstagram is defined by the Urban dictionary…Finstagram, finsta for short, is a mixture of Fake & Instagram. Kids get a second Instagram account along with their real instagrams, to post any pictures or videos they desire. The photos or videos posted are usually funny or embarrassing. Only your closest friends (which never include parents) follow this account). So while I trust my daughter, what I trust more is she and my son will always know more about smartphone technology and the applications available than I do. How can I protect them from something I don’t fully understand? As is often the case when a topic plagues me, I find solace in sharing a bottle of wine and commiserating with my “people” – a core group of women that I regard more like sisters all of which have children of the same age. So one Friday evening this past Spring, two bottles in, we made a pact to stand strong together when our relentless rising middle school daughters began pleading for a smartphone. Not long after that wine infused pact I happened upon something on Facebook (oh, the irony) about the Wait Until 8th pledge. 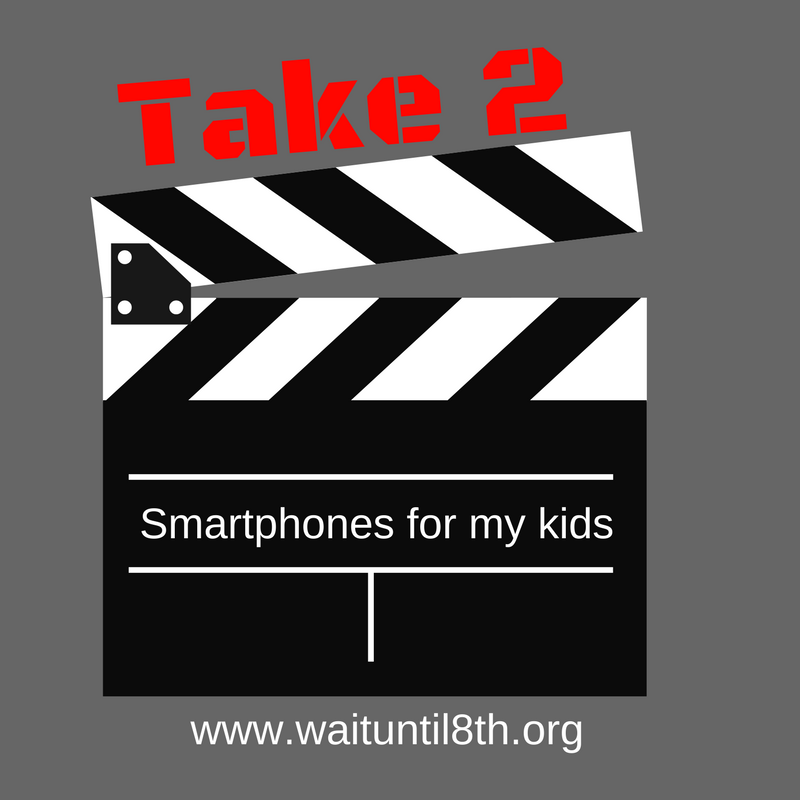 Wait Until 8th is a grass-roots awareness movement that promotes parents take a pledge to delay giving children a smartphone until at least 8th grade. The idea is that banding together decreases the pressure felt by kids and parents alike over the kids having a smartphone. When I learned of this movement, I felt relief and remorse in equal measure. Relief that my small sisterhood and I were not alone in this battle, and yes, sometimes it feels like a battle. And remorse that I didn’t have the good sense to ask more questions or have this conversation in the fall of 2013 before arming by son with that iPhone4. Needless to say, I signed the WaitUntil8th pledge and forwarded it to my mom squad (my daughter hates it when I say that) immediately. I am a middle school mom fighting this battle. I can do it. But I wonder if it would be a battle if society had approached smartphone technology with the same reticence and discerning questions as we do a newly recommended vaccine. This is an important conversation. I implore Virginia Beach Elementary and Middle schools lend their voices to it. Surely there is room in those Tuesday folders to include one more flyer. To the many parents like me that already fell down this rabbit hole: this movement in no way casts judgment or shame upon us. There is no scarlet letter S to be worn. In fact, I believe there are no better people to lead this conversation that the ones that have already blazed the trail. Or perhaps you will just commiserate with me, over a bottle of wine and say " if we had only known then, what we know now." I’ll take it. I am a strong, vocal, and most of the time confident woman who is white-knuckling it through the decision not to allow my eleven-year-old daughter access to a smartphone or social media. I need a village to lean on. Join me in taking the WaitUntil8th Pledge. Like many modern parents, I can fluently navigate analog and digital realities--and value them both. I love a game of Twister. And I speak Minecraft. I can find my way along a country road. But I also love my GPS. I know the value of sitting beside a suffering friend, holding her hand in silence. But I have also experienced beautiful, genuine outpourings of love over Facebook. And while one of my greatest hopes is that my own children will learn how to use technology for good, I am also concerned by the research coming out about the effect smartphones are having on their generation. When I first heard about Wait Until 8th, I breathed a sigh of relief. There were other parents out there who shared my concern, and they had come up with an idea: a pledge designed to help parents band together to delay giving their kids a smartphone until at least 8th grade. Such a simple concept. So much potential to transform communities. Be still, my heart. Wait Until 8th is spreading like wild fire! More than 2,900 parents from 49 states and 500+ schools are delaying the smartphone by signing the Wait Until 8th pledge. In the past month, CNN Headline News, USA Today, the Today Show, ABC News National, Chicago Tribune, Atlanta-Journal Constitution, Kansas City Star, Real Simple and numerous local broadcast stations have featured the pledge. Stories are pouring in on how communities are rallying together around Wait Until 8th. We want to share one of these stories with our community of supporters. Pam Perskie lives in the wonderful community of Little Silver in New Jersey. She and her husband Joe have taken the Wait Until 8th pledge for their two daughters. Pam championed the pledge in her small town to rally many families to delay the smartphone. We are happy to share her Wait Until 8th story with you! Parents are buying their kids smartphones out of FOMO and this is leading to endless FOMO for their kids!